Enjoy working with AquaSoft SlideShow! If you have questions just mail our fast and friendly support: support@aquasoft.net. We are glad when we can help you. Just ask. Anything. In case the download does not start automatically, please click here. 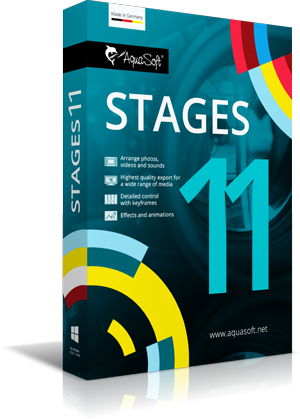 Enjoy working with AquaSoft Stages! With just a few clicks, you can create your first slideshow. 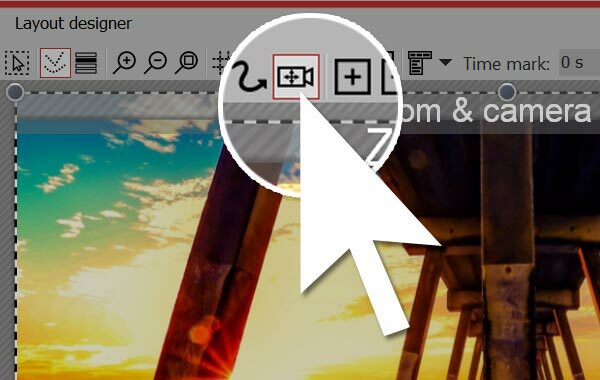 Click the large plus (+) icon on the toolbar and select your images and videos. You can repeat this step at any time to add more images. Alternatively, you can drag an image from the toolbox directly to the timeline. You can move images in the timeline around by clicking on them with your mouse and dragging them to the desired space. Use the storyboard, with its clear overview, if you want to sort your images. Captions may be easily added to one or more images. Select the image in the timeline and click the "Text" tab in the "Object settings" window. Now, you are able to enter your image caption, change the font style and color, and select special effects and animation. 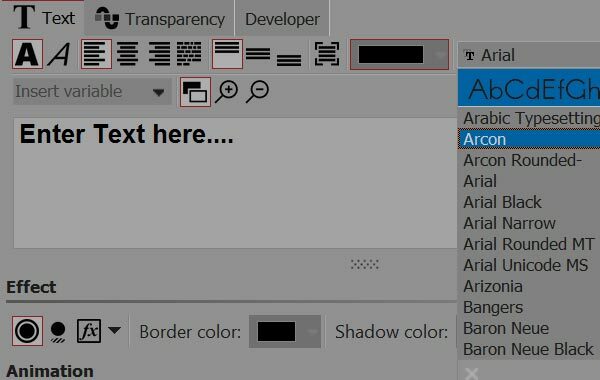 To position text, simply move it with the mouse within the layout designer. Note: you can set your own default font under Extras -> Program settings -> Default image settings. 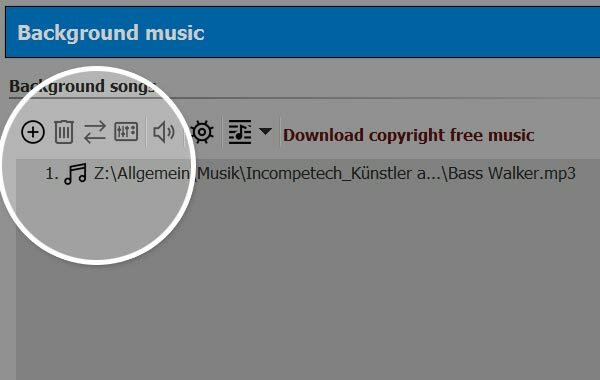 Click the music note icon (♪) to open the background music list. Next, click the plus (+) icon to select the desired music files. You can change the order of the list by using your mouse to drag and drop the files. The order and length of the songs will be displayed as a wave along the bottom track of the timeline. Here, the songs can be rearranged, shortened, and overlapped, and you can adjust the volume by using the volume rubberband. Pro tip: if you want to add multiple sounds/music at the same time, instead of putting them in the soundtrack bar you should use multiple sound objects, and that way you can have more tracks. 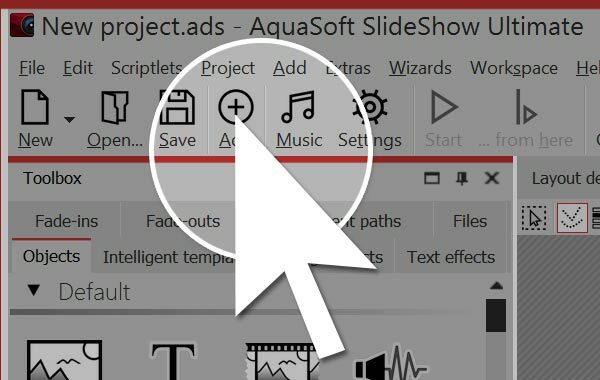 For all of you who want more from your slideshow, AquaSoft SlideShow provides versatile animation and design options. 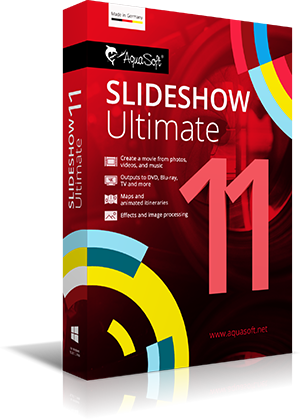 SlideShow offers an unlimited number of images and sound tracks. The tracks are not visible right away, but become available by adding chapters. Drag a chapter from the toolbox to the timeline and add images or other objects from the toolbox to the chapter. 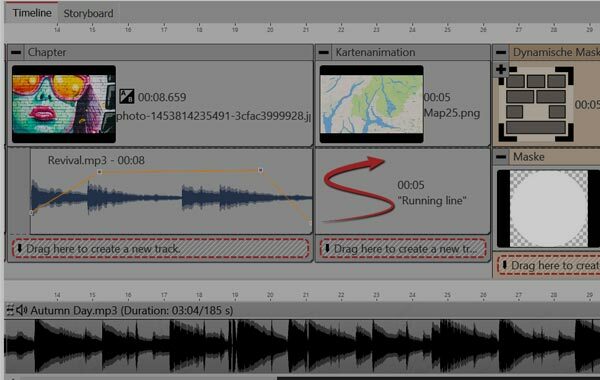 In its expanded state, you will see the field where you can create new tracks. Chapters can also be nested. 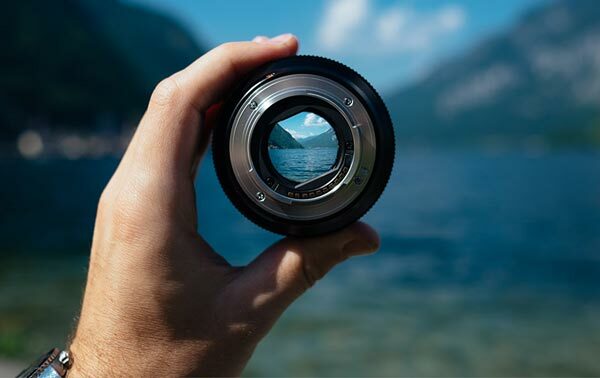 A simple camera pan only changes the visible area of a photo. The resulting effect is as if you look out of a car window while driving: the size of the image remains the same. However, the image content changes as the car drives along. To achieve this effect with AquaSoft SlideShow, simply drag the Ken Burns effect into the timeline and add photos. Looking for even more inspiration and ideas? The design possibilities in SlideShow and Stages are infinite. In our download center you can download templates and pre-sets to start your projects off on the right foot. Stay up to date on the blog with the latest tutorials, example slideshows, and photography tips. On Facebook we have lots of good articles and shareable quotes and photos. Finally on YouTube we have quick tips and extended tutorials. Whether you are interested in HD/Blu-ray, for travel route animation, cinematic effects or universal aperture, it's always well worth a visit.